Sago Mini Toolbox allows the child to pretend to use tools and make projects. 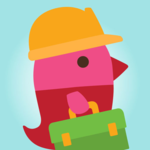 The app is excellent way to teach children vocabulary relating to tools and building, following directions with visual or verbal prompts and learning basic concepts. This app was reviewed with preschool and young elementary children with developmental delays and speech and language delays. The children enjoyed using the tools and building the projects. They especially liked building a robot. The app was used with therapist supervision and they were given verbal instructions to follow while using the app. They were also asked basic questions to answer about the tools and actions. This gave the therapist many opportunities to not only model but also hear spontaneous language from the child. Sago Mini Toolbox is highly recommended for young children. It can be used as a teaching tool or as a reinforcement for lessons taught in a therapy session.